Recently, I have made a depressing discovery. It seems that I, Shelby Louise Stockton, must acquire a boyfriend. I don’t necessarily want a boyfriend, but all of my friends are hooked up in relationships, and per usual, the cheese stands alone. Although I enjoy my alone time, I am a very social creature. Too much solitude makes me anxious. I usually have a stacked social calendar, but lately I am finding more often than not, that at the end of the day, I have no plans. A gal can take night time yoga classes for so long. There are a few reasons why having a BF does not work in my favor. I don’t like checking in with people. As a Scorpio, it is not natural for me to “share” all aspects of my life, as benign as they may seem, with another person. It bores me. I also think that men are a lot of trouble. The return is not worth the investment. Not only that, but the saddest moments of my life have always been while I was in a relationship and the happiest are when I’m single. Do you see the conundrum? But I’m bored, so I may as well get on the relationship train, even if it’s for a bit. One of my friends will surely break-up, and then I’ll be back in business. But something is holding me back, and I haven’t been sure what. Until now. 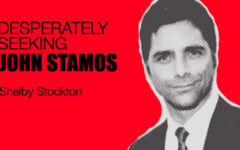 It’s Stamos. I have this unfinished business, and I feel that my life will remain stagnant until I accomplish this goal. I don’t know how to do it, but it must be done. We know what doesn’t work – love letters, songs, flyers around town, pleading to Ellen Degeneres… The list goes on and on. But if I don’t reach this goal, there is a good chance that I will die alone in this attic, with a toned yoga body. I’m reaching for the sleeping pills now. I encourage any advice or ideas that anyone may have to win Stamo’s sympathy. I’m open to suggestions. My life kind of depends on it. No pressure.